“Thoroughly Modern Millie” offers lots of singing and tap dancing at Diamond Bar High School this weekend and next. 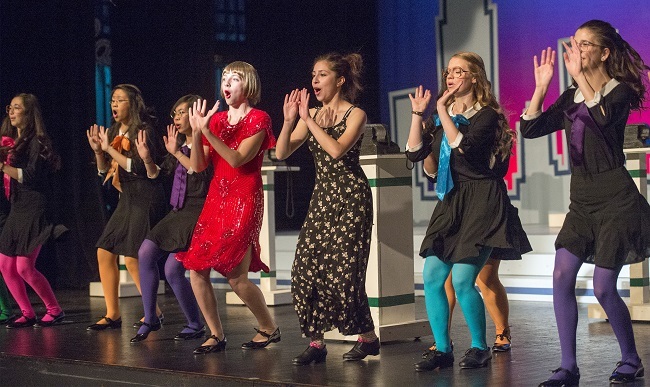 “Thoroughly Modern Millie” is a really big production at Diamond Bar High. It has three different casts with more than 50 actors and actresses, plus twin directors. No wonder, the drama department is adding two more shows, offering a total of six different performances this weekend and next. While the students may be thoroughly modern with their iPhones and iPods, the play takes us back to 1922, when these gadgets were the stuff of science fiction. Some would say a simpler time, but whenever it comes to love and life, do things ever really change? The zany musical opens with our ingenue from Kansas moving to the Big Apple to take a bite out of life. Read more in Rich Irwin’s story MILLIE. Hacienda La Puente Unified students came away with many medals in the Science Olympiad this year. In April, Mesa Robles Middle School took third in the Southern California State Science Olympiad competition in Anaheim. Earlier in the year, they came in second place overall out of 40 teams in the regional contest. 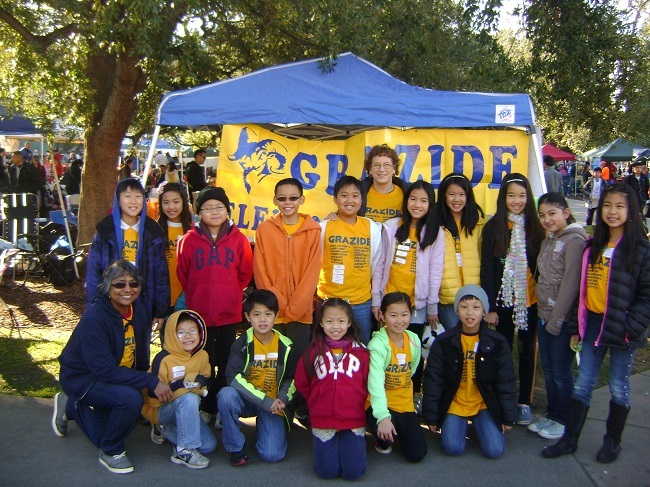 Grazide Elementary came in first overall out of 51 teams in the region, according to teacher Andrea Brown. Los Molinos and Los Altos Elementary Schools also won gold medals. The district’s 22 schools did so well, that the school board held a special meeting at La Puente High School to recognize the students and their coaches. Brown said the district had a total of 27 teams entered in this year’s Science Olympiad. Each team had 15 students and 2 alternates. Which meant, the district had almost 400 students involved in this year’s competition. Autism walks. It talks. It feels. Lessons learned by the kids at Los Molinos Elementary during Autism Awareness Week. A week that ended with a better understanding of a disorder that affects 1 in 88 children, including 1 in 54 boys. 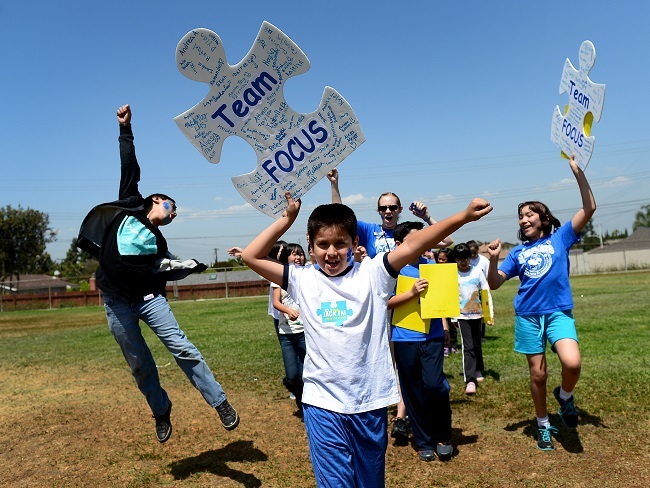 The students even staged their own autism walk Friday, marching in the bright noon day sun. The line of 300 students curved around the athletic field like so many soldiers marching into battle in Hacienda Heights. In this case, they were raising money to battle a disorder characterized, in varying degrees, by difficulties in social interaction, verbal and nonverbal communication and repetitive behaviors. They were coaxed on by JACK FM, a radio station supporting the cause by lighting it up “blue” for Autism Awareness Month. Many students and parents took the time to sign up for the LA Autism Walk on April 20 at the Rose Bowl in Pasadena. Read more in Rich Irwin’s story AUTISM. After evaluating the viability of what has quickly become a costly after-school enrichment program, La Puente city officials have decided to slash the club from a second area location. The City Council in December eliminated its STARS after-school program at one of its three active sites, the La Puente Community Center, because of its dismal participation rates and increasing operational costs. In an effort to further reduce expenses, city officials recently voted to cut the program at its Hurley Elementary in Rowland Unified site once the school semester is over. Officials said the move will allow for the money the city spends to run the program to be used elsewhere in the community. The program’s third and largest site, Fairgrove Academy in Hacienda La Puente Unified, will remain open until other cost-effective options are available. Read more in Juliette Funes story STAR. Want to explore if the ACT or SAT is right for you? Kaplan Test Prep will hold an ACT/SAT practice test on Saturday, April 13, from 9:30 a.m. to 1:30 p.m. in the Rowland Heights Library. The test will have a sample of both tests. The results of the tests will be explained by a representative from KAPLAN on Tuesday, April 23, from 6:30 to 7:30 p.m.
Bring two No. 2 pencils and a calculator to the program. Sign-up at the information desk. Being stranded at the Los Angeles International Airport wasn’t a part of the educational trip to Washington that 27 local eighth-graders spent weeks talking about. The 12-year-olds planned to lift off for Dulles International Airport at 9:02 a.m. Monday, but American Airlines overbooked the flight. Frank Loya, principal of St. Benedict School in Montebello, said he and the students were disappointed. “When we got to the gate, they overbooked the plane, and they wanted me to split some of my students,” Loya told KTLA 5. But Loya said he refused to leave six students behind, especially since the group would have to pay full price for six more tickets, reported KTLA 5. Mary Frances Fagan, a spokeswoman for American Airlines, said the airline is working with the group leader to figure out how to get everyone to northern Virginia. Flight 76 left without any of St. Benedict School’s students or staff. Preliminary plans said the students might fly to Dallas Monday night and get to D.C. by Tuesday afternoon, reported KTLA 5. You’ve heard of volunteers building homes for homeless people. Well, 15 third-graders from Diamond Bar went the nature route this month and built a home for homeless birds. Because birds need homes, too. These birds, called burrowing owls, are not your average birds. They are threatened with extinction. And like people, being homeless doesn’t help matters. Burrowing owls prefer to inhabit other animals’ homes. 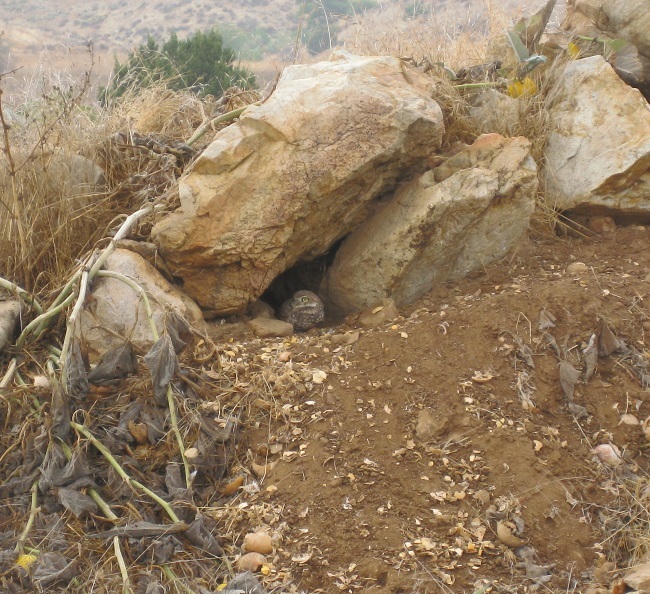 Like squatters, they cozy up inside an abandoned burrow left by a prairie dog or a ground squirrel. The method served them well until the lack of suitable habitat in Southern California produced an owl housing shortage. So, in came Cub Scout Pack 737 to the rescue. They built an owl den using wood and 6 feet of flexible hose, buried it 2 feet underground but left the pipe sticking up as the entryway. The “on-spec” development is like low-income housing for these miniature owls, the smallest in North America. Read more in Steve Scauzillo’s story OWLS.